The Spring Regatta is the first Team Sailing Regatta for the coming season. Six teams competed, 2 teams from Kerikeri High School, 2 teams from Mahurangi College and the Whangarei Boys High and Whangarei Girls High teams. Wednesday and Thursday were ideal conditions with 6 to 12 knot breezes. Friday brought 15 to 25 knots which was more challenging. All the teams gained a lot in experience in handling those conditions. Even though this is a training regatta, there is a trophy for the top team. This year saw the Whangarei Boys High Team take the trophy again from Mahurangi College, then Kerikeri High School and the Whangarei Girls High. 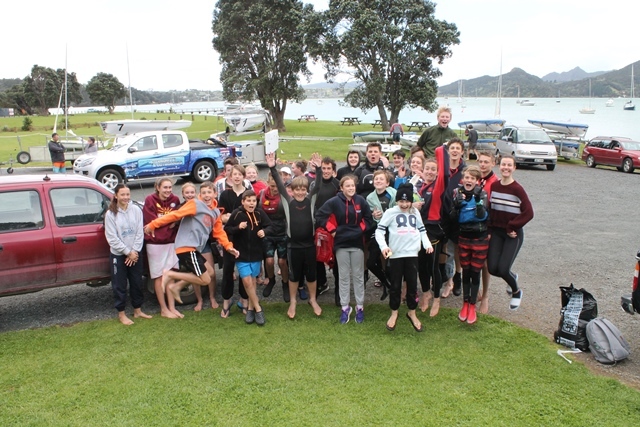 This was a great start for the team racing season for the teams participating and a good lead in to the regional competition at Parua Bay next March and the Secondary School Team Sailing National Regatta at Algies Bay next April. Thank you to Kim Ardmore, YNZ, for doing start boat, Gay Noyer, NZTSA on finish boat and results and Alan Clarkson for being our Race Officer and setting the course. Also thanks to all involved in the event, organising food, getting kids and boats here and set up and generally running the regatta and making it a success.